A lot has been talked about IndiaBulls Dhani 3 Minute loan offers on social media and even on maintream media. 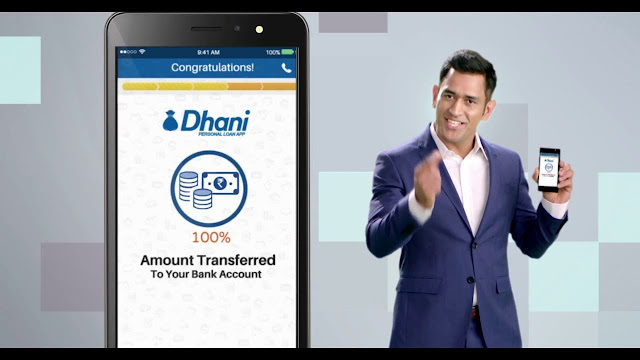 The company even roped in Indian cricketer MS Dhoni to do the selling both on TV and online ads. The commercial is given below. According to the description on its Google Play's platform Indiabulls Dhani is a personal loan app which will make your personal financing needs easier than ever before. However, on checking out Google Playstore reviews of the app, there are many complaints from the app users who complaint about not being billed (EMI) on time or not receiving the loan itself. Before looking into these complaints, let's look at what is being offered on Indiabulls Dhani App. So far the app has received 3.7 rating out of 5 on Google Play. Here are the latest reviews of Indiabulls Dhani app (October 1 to 8, 2018). Socialmediawatchdog.info overall impression of the loan offered by Indiabulls looks enticing but the reviews say otherwise. So, there is a big question in my mind whether one can actually get a loan in 3 minutes! Look at the concerns and complaints by the app uses (some are marked in red colour signifying the important points). ABDUL LATIF SHAIKH, 6 October 2018: First of all thank u dhani.... I just tried whether this app is fake or something but after getting loan in just 5mins i m impressed.... Actually i did not required any loan but for trial i did it & was approved instantly.... Thank u again.... Yesterday was my first installment to be deducted direct. priyansh soni, 5 October 2018: I have taken loan of 50k, today is the date of first installment, still it doesn't deduct from my account and I tried to open app around 30 times I am not able to open my details. Bad experience, if they charge me for late payment then I will not suggest this app to anyone in future. shailesh dongre, 8 October 2018: This is the most worst patthetic loan service ever. Neither process request nor customer care helps. This is not a good loan app. I submitted application on 2ns October. Documents verification done on 3rd. After that no response given by team. I called 28 times to their customer care and team leader. Ramesh Sharma, 4 October 2018: This app is very bad I tried so many to get the loan but could not proceed. It showing an error like document can not updated as there is difficulties in update the documents. I made call to customer care but no one listen the issue. Molugu Varaprasad, 5 October 2018: Very worst. My application no. PL00220765 My loan approved and documents submitted on 27.11.2017 but till now i did not get loan. When I called to customer care they are telling always wait for 24 hrs but nobody giving correct information. Nobody clear the issue. dr Tarun Soni, 5 October 2018: I i have taken loan of 1000000 rs from dhanii. But i have paid installments on time after that they charging me extra fine why i submited a copy of my bank statwment But this issue is not resolved till date... Very bad exp. Manish Narwani, 6 October 2018: Most pathetic and worst service ever.. 2 times my bank account got verified and 2 rupees got deducted as well.. After that the process did not proceed further and my loan application was closed without refunding my money. Shaik Arif's Official, 5 October 2018: App is failing or taking more time to open during sign-in after last update. Thank you Indiabulls for the disbursement of loan, initially my application was rejected but later after some months I've approved for the loan, I request you to keep pre-payment option, as it will be easy to pay before due. A Google user, 6 October 2018: Disbursement was very quick. Interest is very high. 34%.Are you kidding me. It's like Amrish Puri. Will give you loan but very bad interest rate. Noticed that only after withdrawal. You check the CIBIL and all. Give loan to potential customers only still high interest rates. A Google user, 8 October 2018: This is the best time paas app on play store. You just submit your details and won't get anything in your bank account. Fake advertisement everywhere. When you call in their customer care they will unable to solve your query and will put you on mute for half and hour. Janardhan Reddy. 5 October 2018: Very worst bank and useless app. Don't install it and waste your money and time with this bank. Better to go with other private banks for the loans instead going with indiabulls Dhabi and wasting your money and time. My SROP Films, 8 October 2018: If you take loan from indiabulls dhani, these will get your personal , business phone details ruined your personal and business life, your life not be personal. They steal your phone calls, personal details without your consent. They use this to provoke your home and people against you. Musically Fz, 4 October 2018: Truly wastege of your valable time, if you are not able to provide the facility for end user as it should be, application submitted with all required details, correctly. On the other hand. Just received a message,, "we regret to inform you that your indiabulls personal loan has not been approved. "you guys need to inform users with proper reason.thanks. Abdul Khaliq S, 4 October 2018: Before proceeding they are not showing the loan at which rate of interest is offered and 21% is being charged on complete filling up of data. Filling up of application may hit our Cibil Report. Ne careful. S Bijay, 4 October 2018: Today (04.10.2018) I had tried but no success. Before 5 month I was trying but there is same problem. Problem is outside our personal geo area. But advertise at TV India Hamara. But I thought patancheru, Medak district Hyderabad is out of India . A Google user, 4 October 2018: This the worst lootera app. Dont download it. I had just downloaded this app they are saying "your apptn is closed" i dont want to apply why they are taking my applicatio. Also customer care is great they are not receiving calls. Rukhsar Shaikh, 5 October 2018: This app making all the peoples fool about giving personal loans in just 3 minutes it's just worst app we can do just time pass on this app nothing else i,t me and my hubby had try this app but does not work nonsense app , why you are playing with the customer feelings very bad app. Suresh Naidu, 5 October 2018: I applied for top up loan 25th October two times my documents collected but still now I am not received my loan amount and so many times call they will say within 24 to 48 hours you get loan and I sent mail also no one response. prathibha priyadarshini, 6 October 2018: Application Number-TP00009096 still no update about this loan agreement is also signed but now the customer care executive say the offer period is over and I'm not eligible for a too up loan very bad. amar raut, 7 October 2018: Hello, I done foreclose, but till I'm geeting calls and sms from your side. Send you many mails regarding this, till not get single feedback from your side. Please clear this issue ASAP. Pratik Joshi, 8 October 2018: Worst app... they say i am eligible for loan..but when i submitted my documents it shows a technical error when i called customer care they told me to wait for 24hours everytime they have the same ans wait for 24 hours they told me to mail the error i have done that too with screenshot but no repons. Vikas S, 4 October 2018: Why are u keep sending so many SMS.. How to stop it.. You are not able to process the loan but u r sending SMS to get loan. Very few people are happy with the loan process. bobby parvez, 7 October 2018: It has been a seamless good experience. Even when I was feeling a little difficulty , one of your representative ( Princy ) , called and explained everything in detail and got it sorted. I can't say about the future , but so far , a really really good experience. jijo christopher, 4 October 2018: Awesome experience with this app.first time i tried this app i thought its a joke but believe me friends its very usefull. But first time they will give you only 3000 rupees loan for checking your repayments.Really iam very happy with this app. A Google user, 6 October 2018: I love it.. I tried for 1st ever online app throw loan application But I am shocked box I got money in 3 mins to my account.. Brilliant Service .. thanks to Indiabulls Dhani App.. I Love it. AFZAL SHAIKH, 7 October 2018: It's most important service for India I am lots of thanks for India bulls dhani app it's really taken loan in just 3 to 5 minuts only very nice. THE CHOICE IS YOURS. YOU CAN TRY IT BUT TAKE CAUTION. They never keep their promise. I gave them my Aadhaar.